The day has finally arrived and we are moving out of our home of 20 years to take up residence in temporary housing. If it doesn’t sound exciting or romantic, it is because it is not. A few months back, we had a dishwasher back up and cause havroc in our kitchen and lower level. Restoration work to replace 2,000 square feet of hardwood flooring and repair damage will begin shortly and much of our kitchen will be removed while all our possessions will be packed up into storage. Don’t even get me started on the logistics of anticiapting what we’ll need for the next month or two before it’s all taken away! The final meal before the move, I will call “Everything but the Kitchen Sink” breakfast bowl. Don’t let that title fool you. It was delicious, even if the avocado was over ripe! I’ve been seeing bloggers post “bowls” of every kind and I have never thought of posting one although I’ve been making them all my life. I guess it is now ” trendy” to make these bowls. Where I grew up, we called kitchen-sink cooking, “giblottes”. That is one of my favorite words in the whole world to say as it rolls off the tongue just like the food creations classified as giblotte. I know you’ve made a giblotte or two yourself over time. Thow-it-all-together-in-a-single-bowl-kinda-of-cookin’! Never 2 the same. Always tasty and adventurous. This one emptied the fridge and nourished us for the long day ahead. Even with the movers crawling around the house, I still managed a photo for the blog! Now, all our bags and packed and we’re ready to go! Season the eggs with the hot sauce, salt and pepper. Scramble until just set. Sprinkle with the shredded cheese and fresh chopped herbs. In 2 serving bowls, reheat the grains. Top each with half the eggs, half the avocado mash, some arugula, half the chopped tomato and a generous dollop of hummus. 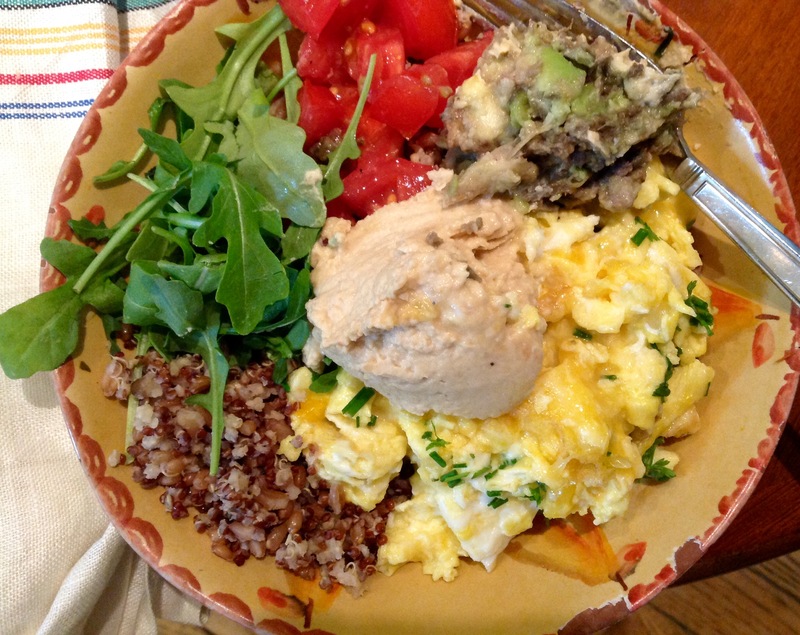 This entry was posted in Recipes and tagged breakfast bowl, quinoa avocado breakfast bowl by Johanne Lamarche. Bookmark the permalink. Thanks Liz. We will be in Malvern at the Royal Worthington condos near the Wegman and Target. It’s a big job. Hopefully the kitchen won’t sustain any damage and cause delays. Right now they are telling us a month. Not sure what to do with Oreo yet. Will see how he does. I will come by often. You have an honorary membership in the giblotte club Elaine! Thank you for your good wishes. i’ll have to coach you on real slang French Canadian pronounciation! You did well my French Gardener, look at that bowl full of your refrigerator’s leftovers. Great job! I had no idea you had the mishap in your kitchen. Oh gosh, that had to be devastating…but the flip side?? Will you be getting a brand new kitchen? Would love to have you and your husband over sometime just so you don’t have to cook in your new digs 🙂 Let me know if you’d like to take us up on it. In the meantime, stay positive and stress-free 🙂 Enjoy this Labor Day weekend too Johanne. That is so nice of you Loretta! We are in Malvern in 2 condos and I can walk to Wegman’s. Full kitchen(s) with basic set up, so no excuses. We are getting new floors but the kitchen island, banquette, desk, and appliances all have to be removed to gain access. One cabinet has to be replaced. There is a lot of risk of damage and if so then the kitchen will have to be replaced. We remodelled it about 10 yrs ago so we are devastated. Fingers crossed. We would love to get together with you and Bert. My husband Chris is going to India end of the month for work and I am sure he’d love to talk to you. I’ve noticed the flux of bowl recipes lately Joanne, and laughed out loud at your reference to kitchen sink cooking, which basically what it is, but I’ve never heard the word gilbotte! I must remember that, love it! Fingers crossed that your construction stays on time and before you know it you will be back cooking in your new kitchen! Thanks Jenna! Me too. I had another ‘bowl” post in my inbox this morning, mostly from young hip bloggers, like they invented the concept! We have a lot of credentials in giblotte creations don’t we????? LOL! Happy Labor Day weekend to you. I enjoy all of your blogs, recipes and gardening ideas. I have prepared all but one recipe and have enjoyed them all. It is so nice to have some ideas for meals!! I am sorry to hear about your renovations. I have renovated all five homes I have owned and it is not fun, but I hope it will be worth the finished product!! I hope you are having your dream kitchen built. I ride my bike along the path that passes your new abode. Would love to meet you for a walk if you have time. Thanks so much Christine. That would be lovely. That looks tasty! Sorry about your kitchen! What a disaster! Fingers crossed for you! Going back & forth from folks to home is crazy – I keep carrying things along with me, lol!! I never know what is there and what is here, so I know the feeling of not knowing what you need! Sorry to have not stopped by in awhile but I’ve gotten lots of inspiration! The kitchen hasn’t been packed yet and everyday when I go visit and feed our cat who is NOT a happy camper, I bring back things. Executive housing residents must not cook!!! Go Homer! Dogs travel so much better than cats. temp housing has white caroets in bedrooms, white leathernsofa and chairs….not practical for a cat who may seek revenge for uprooting his world! he will move when demolition starts. At this rate, it might be never!